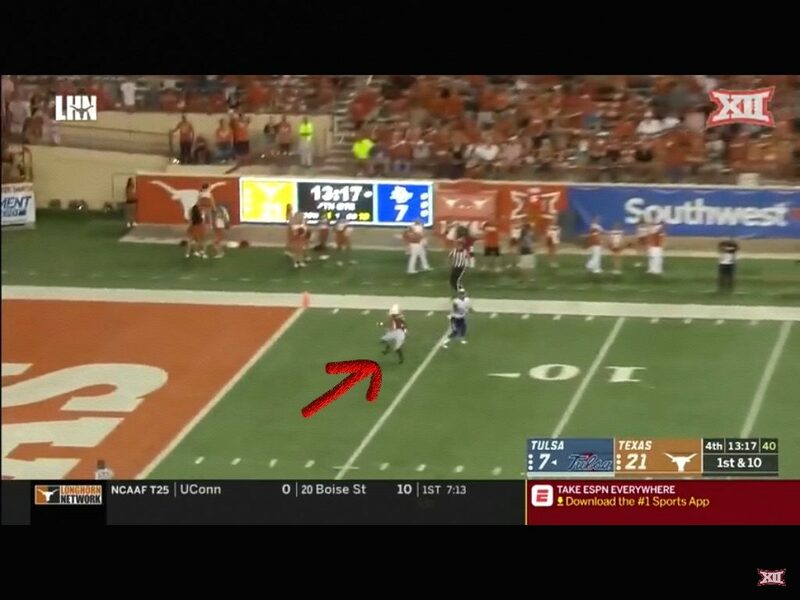 Great play by Caden Sterns the true freshman to go up, make the catch and come down with his feet in bounds. To have the awareness to look down to make sure he stays in here is a big play. Ball was badly underthrown, but that’s the name of the game, making plays on the ball. The offensive line is a ton better this year. 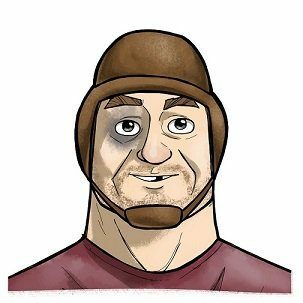 Ehlinger has had great protection in both games. He’s taking a lot less hits, and it’ll make this offense go. 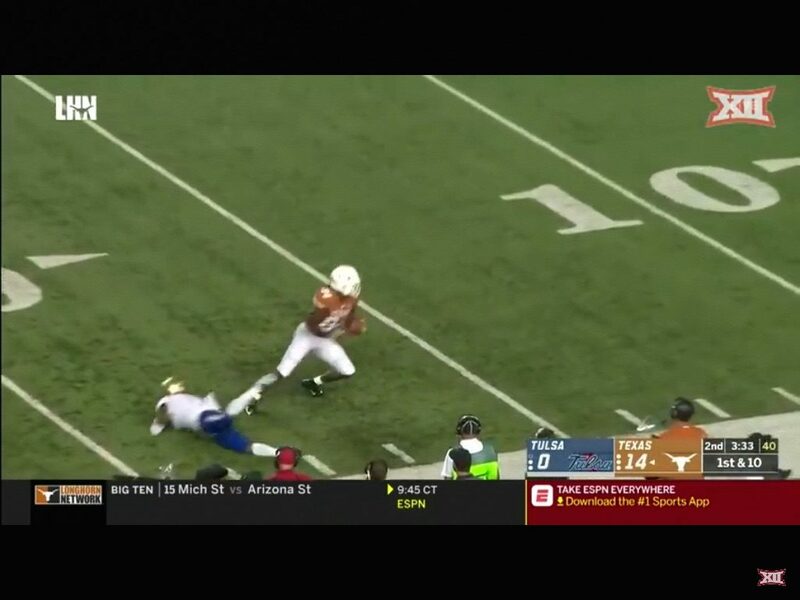 Granted it’s only Tulsa, and it’s only a three man rush, but how often did we see lesser opponents smacking the longhorn QB’s last year due to poor protection? Exhibit B. Down on the goal line a year ago we’d see unblocked defenders or negative push. Here we see the big boys controlling the action. 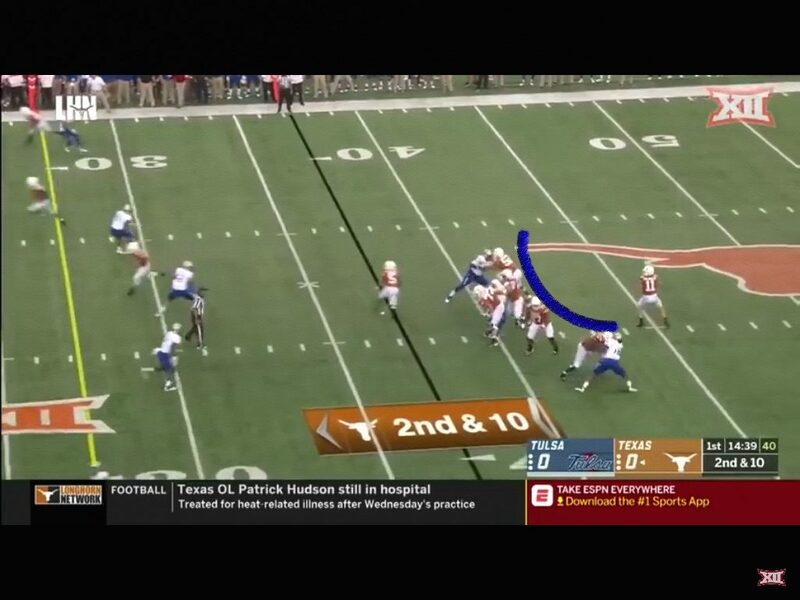 It’s a zone read to Watson, and Sam makes the absolute correct read here in pulling the ball. 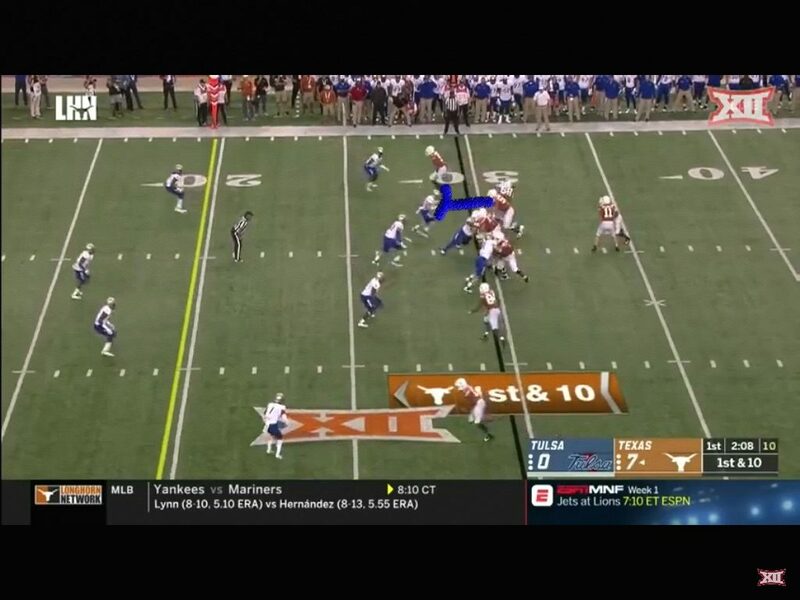 He walks into the end zone, and Texas was fully in control of this game. 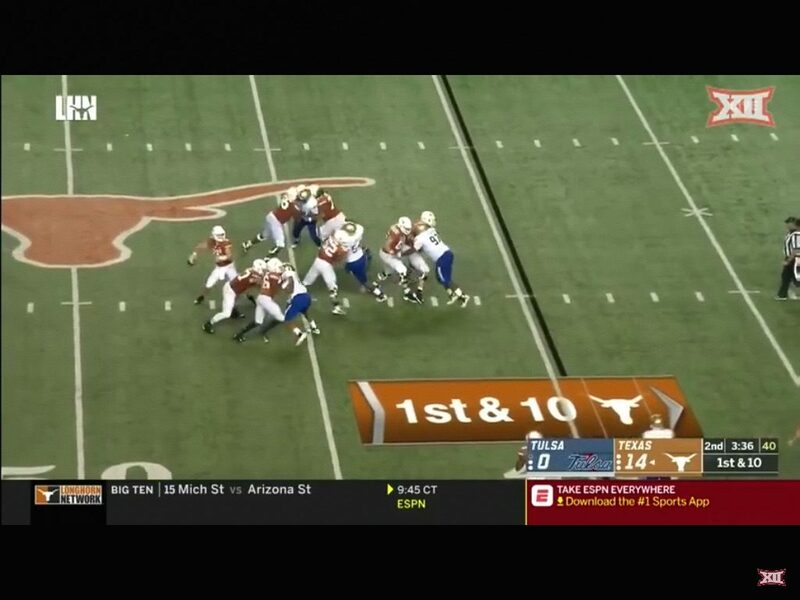 Exhibit C…Look at the eyes of the o lineman getting up to the defender. You have to see what’s going on and keep your head up. In essence play with your eyes. This one springs Ingram who I’ve been thoroughly impressed with. Great job o line and Ingram. Texas has themselves a ballplayer in this young man. Bodies strewn everywhere and he ain’t got time to talk. He’s gotta do some endzone dancin! The secondary has some young talented playmakers. 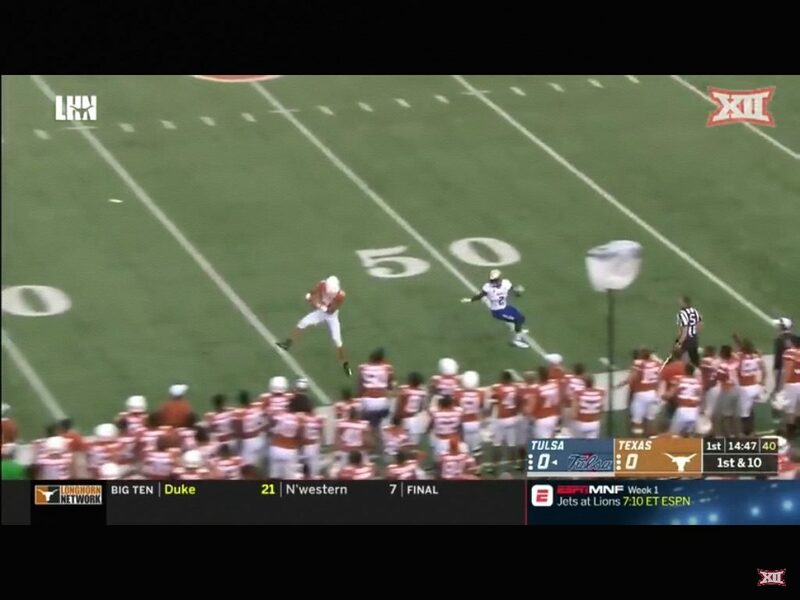 Here’s another pick by the Longhorn secondary. Far too often in todays game you see DB’s never turn around and play the ball. Texas did this all day long. They’re getting better. More great protection by the O line. 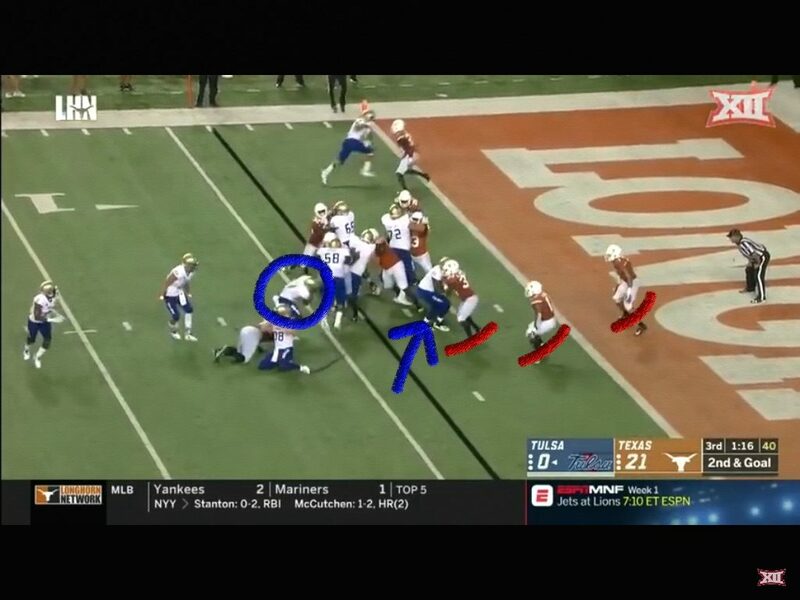 Tulsa brought more rushers this time and the Horns went max protect. This O line is getting better and better. As they get more talent on campus, look out! Shoutout to my former teammate Coach Yancy McKnight. This group looks a lot stronger than they were a year ago. Humphrey especially. 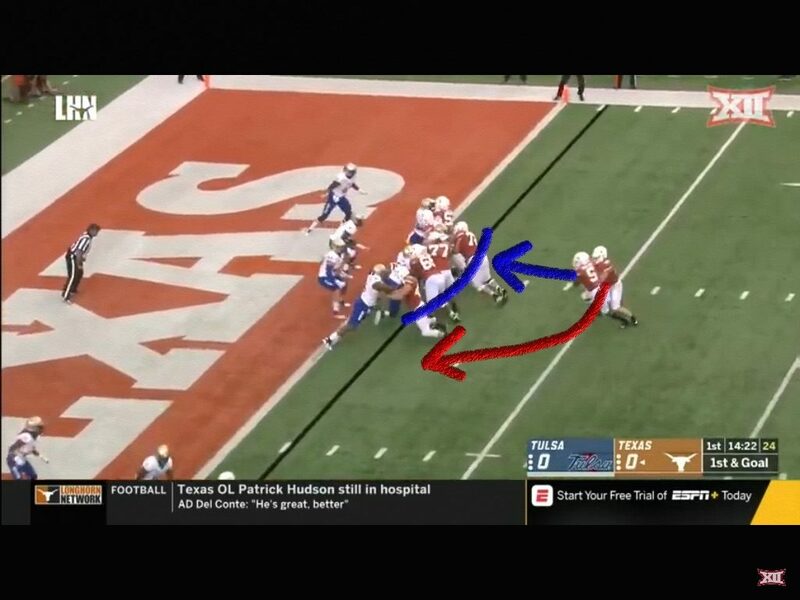 The big receiver breaks a tackle here, and then runs over another defender on the way to the house. The defender with the blue arrow has to be more physical here. He has to bench press that man off of him and squeeze the hole. 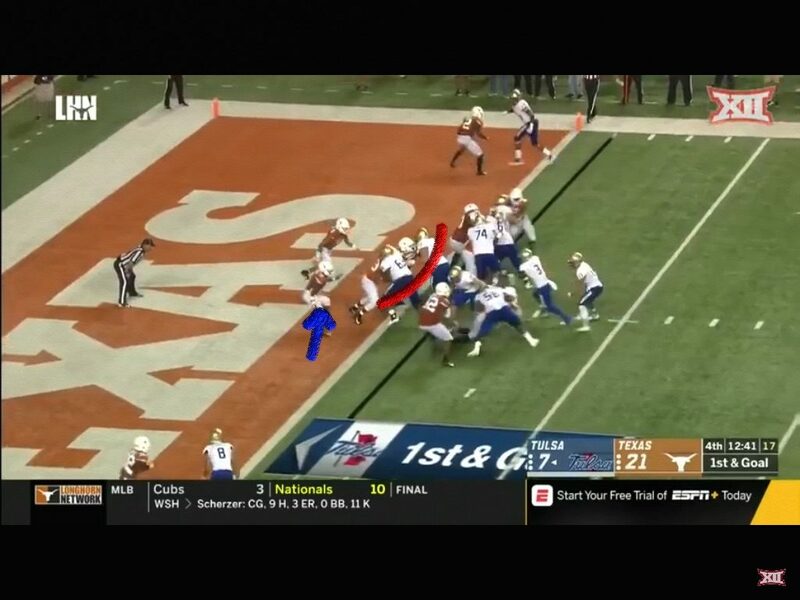 It would force Brooks, the Tulsa RB, to bounce outside to two longhorn defenders. Still all three horns I put red marks under are flat footed. 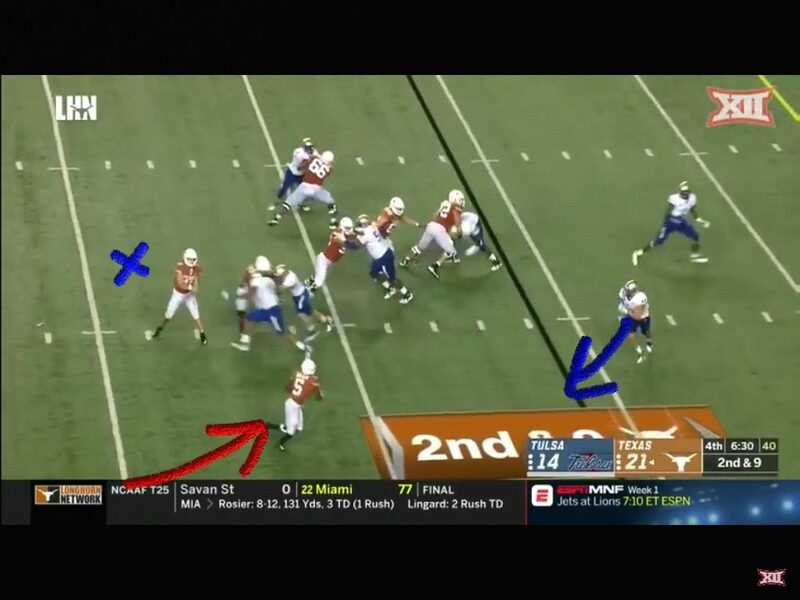 They have to be more aggressive once they read run & know that Brooks has a ball. They gotta get up there and make a stop. This time he got a little turned around here. 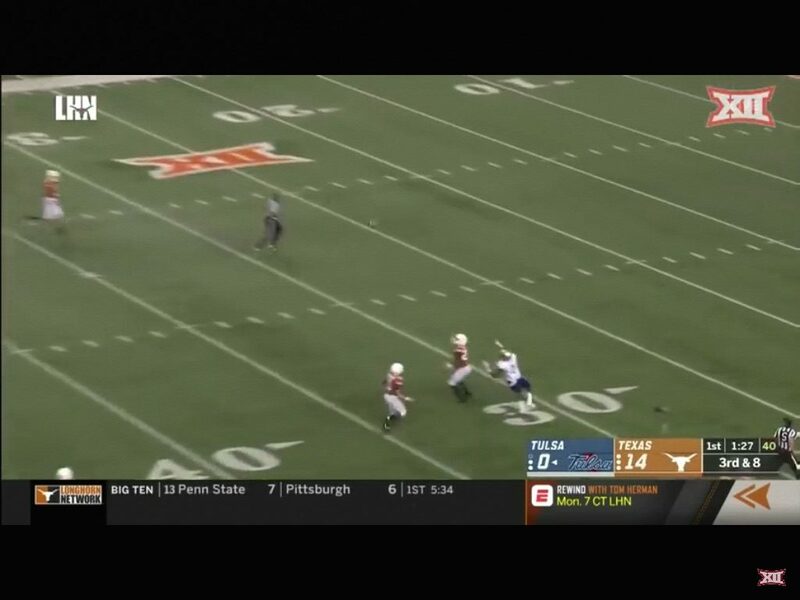 This may have been the play that let Tulsa get back into it. Sometimes you try to do too much, and pay for it. 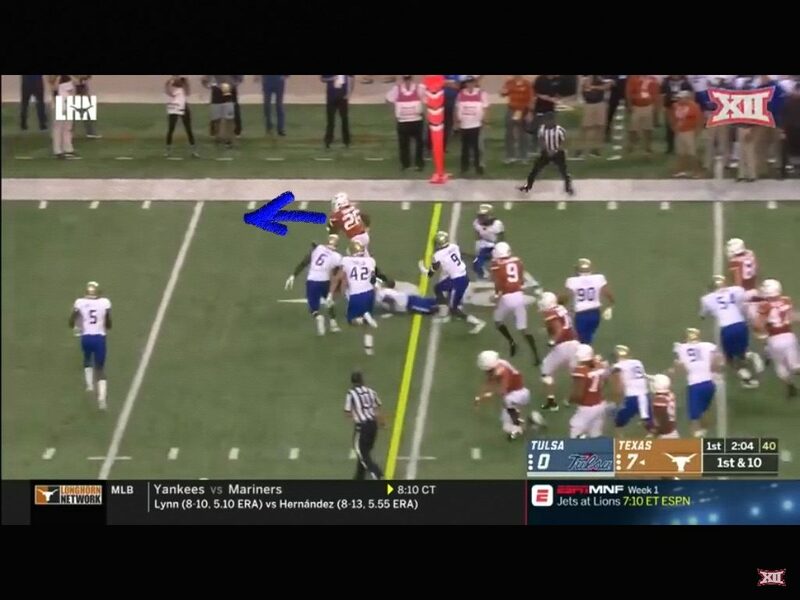 This is a play in my opinion that if it goes the other way, then Tulsa rolls over and dies. Tulsa gets a good push in the middle on 1st and goal. That just can’t happen to those two defensive tackles. They have to get lower and play with better pad level. You absolutely cannot get moved in short yardage. Even still that safety has to get up in there and be more aggressive. Sam has to stay in the pocket. He almost drifts into the rush. He’s almost outside of his tackle and is eliminating what leverage his big man has. If this wasn’t a swing pass and quick throw it could’ve cost em. Speed Kills…Man Watson can fly. This team is getting better. Especially offensively. They have some young talent that needs more reps. I’m in the camp that believes that Texas beats USC this year. The Horns should’ve got em last year. They’re on the right track, and I expect them to keep improving. Hook Em!